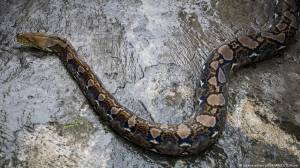 Indonesian authorities have apologized and launched an investigation after police officers in the restive Papua province were seen draping a live snake around a suspect's neck to elicit a confession during an interrogation session. A disturbing video circulated online shows an alleged pickpocket — handcuffed and sitting on the floor barefoot — yelling in distress as an officer pushes the snake towards his face. The man is asked by an officer, "How may times have you stolen mobile phones?" "Only two times," the suspect responds, cowering in fear. The officer is heard ordering the man to open his eyes and at one point even threatens to shove the snake into his mouth and under his trousers. Jayawijaya police chief Tonny Ananda Swadaya issued an apology, saying, "The investigator was not professional in doing his job." "The snake was tame and not poisonous or dangerous and the incident was their own idea so they could get admission of guilt as quick as possible," Swadaya said in a statement, adding that stern action had been taken against the officer. "We will work more professionally in the future," he added. A police spokesman said the snake had been kept as a pet at the police station and was used to scare away drunkards causing commotion in the neighborhood. Indonesian security forces have been repeatedly accused of committing human rights abuses against Papua's ethnic Melanesian population including extrajudicial killings of activists and peaceful protesters. A separatist movement has simmered in the region for decades. The former Dutch colony was made a part of Indonesia after a widely criticized UN-backed referendum in 1969. "They have long known that snakes are being used by police and the military (in interrogations)," she said. "So they're not surprised."